FACT CHECK: Does a photograph document that Walmart stores were ordered to remove “Made in the USA” signs because the company is “ashamed of the U.S.”? 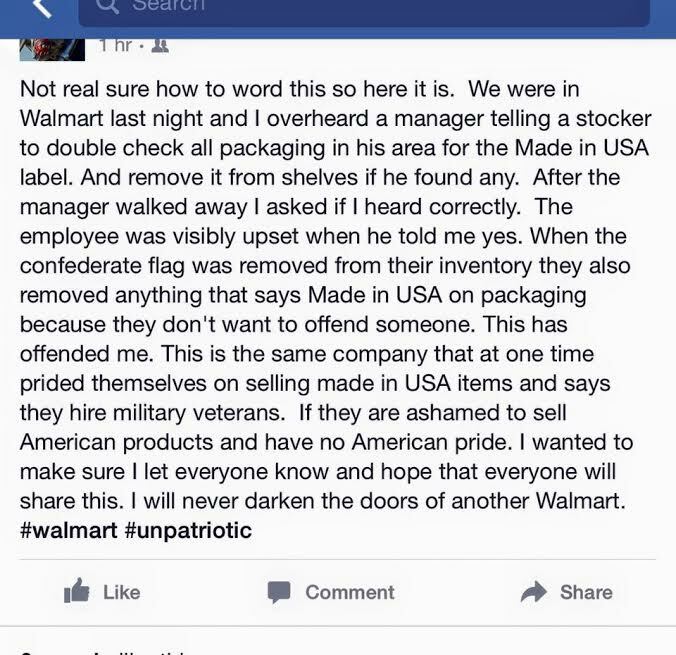 Walmart has been told to remove Made in the USA signs! They are ashamed of the US! Boo Hiss! Walmart is going all out for America, pledging to buy an additional $250 billion in American products. To that end, the world’s largest retailer will host a manufacturing summit next week where it will look for U.S.-made products to sell. The event starts three days after the Fourth of July and promises to be a star-spangled affair. But one item that probably won’t make the agenda: The made in the USA labeling mess on Walmart.com that the company has pledged to address after TINA.org brought the issue to corporate officials. TINA.org’s investigation into the retail giant’s website readily uncovered more than 100 instances of false and deceptive made in the USA representations. 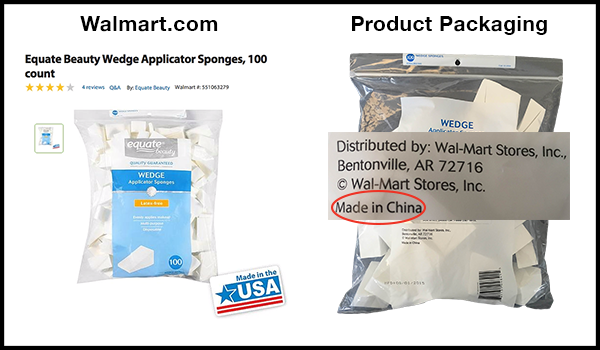 The investigation revealed products labeled “Made in the USA” though packaging indicated they were “Made in China.” TINA.org also found USA product labels on Walmart.com that were in direct conflict with the site’s own specification information on the same webpage. In a letter sent June 22, TINA.org called on Walmart to remove from its site all false and deceptive made in the USA representations. The company cited multiple reasons for the mislabeling issues including “coding errors,” outdated information from suppliers, and a convoluted process by which USA labels and product specifications are handled separately on the site. Walmart said TINA.org’s letter has since prompted the decision to streamline that process. But while Walmart pledged that it would fix the problems, and has made limited progress in removing some of the false labels, the website is still riddled with USA labeling issues.